Does your teen have a bank debit card? The transaction will be declined (most cases). The result: no overdraft or fee, but an embarrassing reminder for your teen to check the card’s balance beforehand and keep a little cushion in the account for little emergencies or miscalculations. 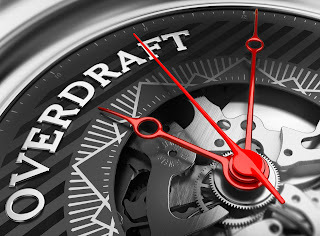 The transaction may be honored by the bank, but no overdraft fee can be assessed. The result: typically a negative balance until the account is replenished with a sufficiently large deposit or transfer. So, your bank debit card toting teen is safe from dreaded overdraft fees as long as you opt out properly, right? Notice how I said “one-time” debit card transactions above. That’s because overdrafts from recurring charges are not protected by Regulation E. So, whenever your teen registers a debit card as the source for automated monthly or annual billing, there’s a risk of incurring overdraft fees. Think Spotify, Netflix, online gaming subscriptions, or even that monthly gym membership. In those automated repeat-billing cases, your bank or credit union is free to charge a fee for an overdraft, whether you opted out of the debit card overdraft service or not. So, find out how your bank or credit union handles the overdraft situation with automated repeat billings. If your teen incurs an overdraft, ask them to waive it. Sometimes they will. Better yet, find a reloadable prepaid debit card offering for your kids that guarantees no overdraft fees of any kind, ever. I happen to know of one here. There are others. Shop around and compare. When it comes to overdraft, I’ll take my teen’s embarrassment over $35 fees every time, not just one-time.